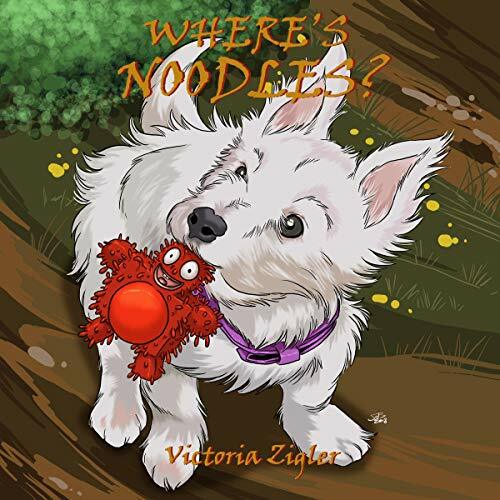 Noodles is a strange red creature with a squeaker in his tummy, who just happens to be the favorite toy of a West Highland white terrier named Lilie. At least, he is now, since the bushy-tailed squirrel and cuddly triceratops fell apart while she was playing with them - totally not her fault, by the way! Now, noodles is missing. Lilie’s sure she left Noodles on the living room floor when she went walkies. But when she comes home and goes to fetch him so they can have a nap together, Noodles isn’t there. Where’s Noodles? Is he somewhere else, or is he lost forever?